Dog sleds (or sledges) are important to Arctic peoples' culture and lifestyle. Utilizing dogs to pull sleds is thought to have begun in Siberia around 7000 years ago. Up until recent times, travel by dog team was the main method of transportation during the winter. Dog sleds allowed people to move or travel to hunting grounds. Although it is now common to have eight to ten dogs, previously people could maintain only two or three dogs and sleds were used to haul gear while people usually walked. For at least 4000 years the Inuit bred dogs or qim-miq for sleds. The Alaskan malamute, originally completely native to Alaska, is a large dog developed by the Inuit of Alaska to haul heavy loads at steady speeds over long distances. It is related to the Finnish spitz and the Samoyed. The slightly smaller Canadian Inuit dog, also known as American husky, or the Esquimaux dog is endemic to Canada while the Greenland dog is the same breed, that is, an Inuit dog originating from Greenland. The Alaskan husky is a crossbreed from the Siberian husky. There is a large amount of traditional knowledge related to the utilization of dog sleds, and almost every technical aspect is subject to variation, contributing to a large and often diverse body of traditional knowledge. There have been great changes to the equipment needed for dog sleds as the available materials changed. The sled, whips, lines, harnesses, and connectors were constructed from a variety of different materials. In areas north of the treeline, wood was a precious commodity for building sleds and was acquired mainly by collecting driftwood along the shores. Consequently, people fashioned sleds from other available materials. Frozen fish wrapped in skins were used to make runners with antler or bone to form the crosspieces. Sleds have also been constructed from whalebones and antlers. Sled runners were often shod with bone, ivory, or ice; more recent materials include steel or plastic. Sleds with soil or sod runners need a layer of ice, which is made by lightly spraying water from the mouth and then smoothing over the area with fur. The water freezes, forming a glasslike layer over the soil. Currently, wood is readily available and most sleds are constructed from wood with a variety of different runners. The optimum runner for a sled changes with environmental conditions and the type of snow. Flexibility is the key element in construction and sleds are lashed together without nails to allow for elasticity of movement when crossing rough terrain. An Inuit hunter travels by dog sled (sledge) over the frozen sea ice, Northwest Greenland. Canadian Arctic when moving heavy loads. In Greenland and parts of the Canadian Arctic, a sled with extra posts in the rear is used, making it easier for standing and loading gear. The fan hitch has advantages when traveling across ice. Because each dog has its own line, they can take the slack needed to jump across obstacles on rough ice. In addition, the dogs instinctively sense when they are on thin ice and disperse their weight in response. 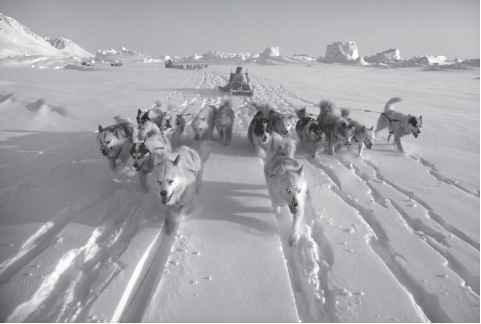 The lead dog is on the longest line and helps to direct the other dogs and steer the sled according to commands. In other regions such as Alaska, the dogs pull the sled in a tandem hitch, where two dogs are placed side by side along a main line. In Siberia, the dogs are staggered, alternately behind one another rather than next to each other in pairs. A lead dog can also be used, positioned alone in the most forward position. The sled for a tandem hitch is typically narrower than that for a fan hitch, and has an area to stand at the rear of the sled as well as a basket area for gear and sitting. The tandem hitch is well suited to maneuver around trees and other obstacles in northern forests. In Alaska the tandem hitch is used even north of the treeline. In dog team racing, such as the Ididarod, the tandem hitch is used and light and fast sleds are constructed. The lines, traces, and harnesses are made from a variety of different materials. In the Canadian Arctic, most people make their lines from ujuk (bearded seal). The skins have to be carefully cut in order to make the long ropes. Bearded sealskin is tough and durable. Although people still use skin ropes, they now also substitute nylon ropes. The harnesses are often made from sealskin or whale skin, which is softer and more supple. Currently, many harnesses are sewn from reinforced canvas webbing or synthetic materials. Most dog team owners have preferences for the exact design of the harness. Whips are often considered to be one of the most important tools in training a dog team. They are about 25 ft long and are constructed from sealskin and whale skin. Much practice and skill is needed to use the whip correctly. To travel by dog sled, it is necessary to have control over the dogs. The lead dog is a crucial part of traveling by dog sled and there are very diverse ways in which people choose their lead dog. Some believe that a male dog is best as a leader, else there will be time lost due to pregnancy. Others prefer a female dog for the lead, especially if the team consists of a litter of her pups. It is believed that a team of siblings shows a larger degree of cooperation and that mother retains her natural dominance. Others believe that behavior is the relevant dimension, with different views on whether an aggressive or a calm dog is to be preferred as a leader. A good lead dog must be intelligent and take directions. The variety of techniques used in dog sleds, whether it is choosing a lead dog, constructing a sled, or making a harness, is consistent with an understanding of the diversity of traditional knowledge. Dog sleds are still used in the Arctic, but far-reaching changes, including living in permanent settlements, wage labor, and the use of snowmobiles, have significantly reduced their numbers. Indigenous and local hunters in the Canadian Arctic no longer depend on dog teams for hunting. By using a snowmobile, people can go hunting and return to town quickly. As sanctioned by law, sport hunters for polar bears in Canada must be taken out by a local guide and dog team. Therefore, despite their reduced numbers, some dog teams are retained for guiding purposes. In Greenland, hunting is restricted to using dog sleds and therefore there are still a great number. Dog sleds are often used recreationally and dog team races are an important part of many Arctic festivities and games. Why is dog sled important to the inuit? What are the uses of sledges for Greenlanders? How are huskies useful to the people of Greenland? How inuit people use husky? What is a sledge how is it useful for eskimos? Do inuit husky traces have buckles? Are dog hitches called traces? Did inuit culture invent dog sledding or was it brought from the europe? How did the native Inuit people use huskies? Did inuit use artic fox for puling dogsleds? What did inuits call their sled dogs? What is the transportation method of the Inuit? What do inuits call sled dog races? How did the eskimos make sledges? How far can a inuit sled dog pull in one day? 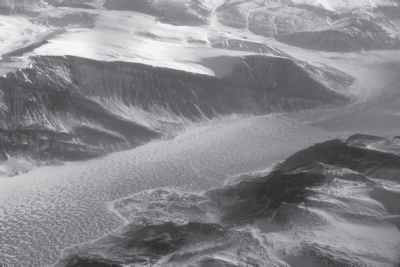 Why people travel by dog sled in the arctic? Did the inuit people make dog sleds?